Omaha artist Peter Cales sometimes struggles to earn enough money from his artistic practice–one of the biggest obstacles to his commercial success comes from a surprising quarter: the art sale fundraisers used by the very Omaha charities that are supposed to be serving the artistic community. According to experts in the field, the kinds of fundraising models used locally do have the real potential to create an economic conflict between artists and arts organizations. While the problem is not unique to the Omaha area, an examination of the best practices identified by these experts suggests that problem may be particularly pronounced here. A survey of local fundraisers by arts organizations—including the Omaha Creative Institute, the Union for Contemporary Arts, the Bemis Center for Contemporary Arts, Project Project and the Lux Center (in Lincoln)—shows that some local organizations adhere to a majority of best practices, while others fall short of the ideal. Kelsey Karper, former deputy director of the Oklahoma Visual Arts Coalition and currently co-principal of Current Studio, which develops new methods of financial support for artists, sees the question of fundraising on the backs of artists as one of ethics. She notes that “we need to be careful that cultural institutions remain as advocates for artists rather than becoming mechanisms simply for expropriating value from artists. The dynamic that concerns Karper is especially pronounced where charities set up a “race to the bottom” dynamic among participating artists. In this type of fundraiser, prevalent in Omaha, the nonprofit establishes a structure that encourages the artists to compete against each other by offering work for inordinately low prices. Cales also acknowledges, however, that the result of this common practice is that work that previously sold for several hundreds or thousands of dollars now becomes associated with the much lower hundred dollar price point in the minds of the buying public. Arts organizations can minimize the “race to the bottom” if they choose, however. Both the Lux Center and the Omaha Creative Institute will reject submissions to their art sales that are not priced appropriately, asking the artist either to reprice their work or to submit a new work instead. 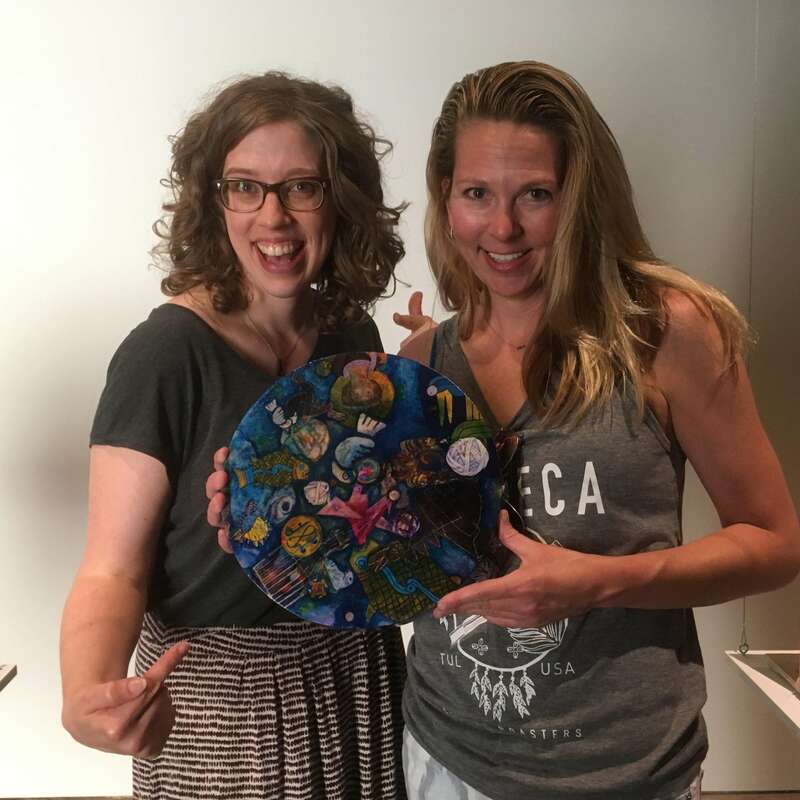 “Last year,” said Andrew Saladino, executive director of the Omaha Creative Institute, “we had an artist who contributed a work to our [art sale] event that was worth way, way more than our sale price. It was a disservice to the artist and a disservice to the other artists. Jo Ann Emerson, former Executive Director of the Lux Center, also called out pricing competition among artists as one of the areas most ripe for abuse by charities. In addition to undue pricing competition, arts charities can also harm artists by offering so much artwork for sale at one time that they flood the market. If arts organizations fail to maintain a proportional relationship between the supply and demand, artists will likely be faced with large quantities of unsold work and, in auction formats, large quantities of work selling at minimum bid. Unlike pricing, the ratio of supply to demand is a factor over which artists themselves have absolutely no control. 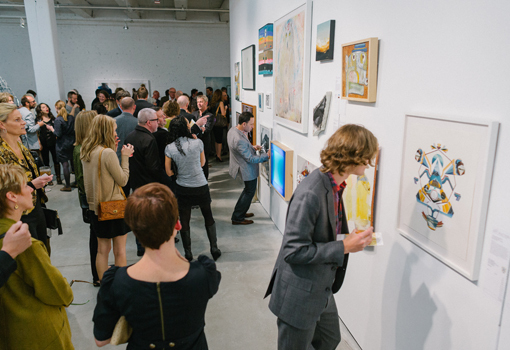 Local artists identified the Bemis Center’s annual arts auction—the largest arts fundraiser in the area—as problematic. According to these artists, the Bemis puts up hundreds of works up for sale every year even though the majority seldom sell. Larry Roots, owner of Midtown Arts Modern gallery, says these kinds of overstocked events do real harm to an artist’s ability to earn a living the rest of the year. “An auction is good for an artist only if it protects the value of art, but if the sale price goes way below market value, that’s where it’s a problem because it impacts the value of the rest of their inventory,” Roots said. “Any art appraiser will tell you that art is valued based on the price of the last sale. Many arts organizations avoid the problem of negative impacts on the value of artist work by commissioning creations for fundraising that are different from the artist’s regular inventory and therefore of limited value as a point of pricing comparison. The Royal College of Art in London operates one of the most successful art sale fundraisers in the world, RCA Secret, on this model. 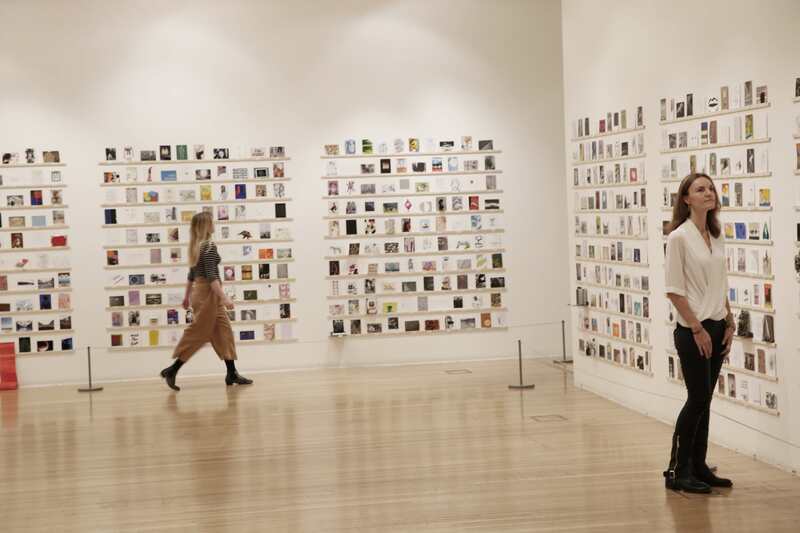 Each year the RCA offers between 2,000 and 3,000 artworks for sale, each created specifically for the event on a standard-sized postcard. Purchasers of these postcards only learn the identity of the artist after they’ve completed their purchase and are allowed to see the artist’s signature of the backside. 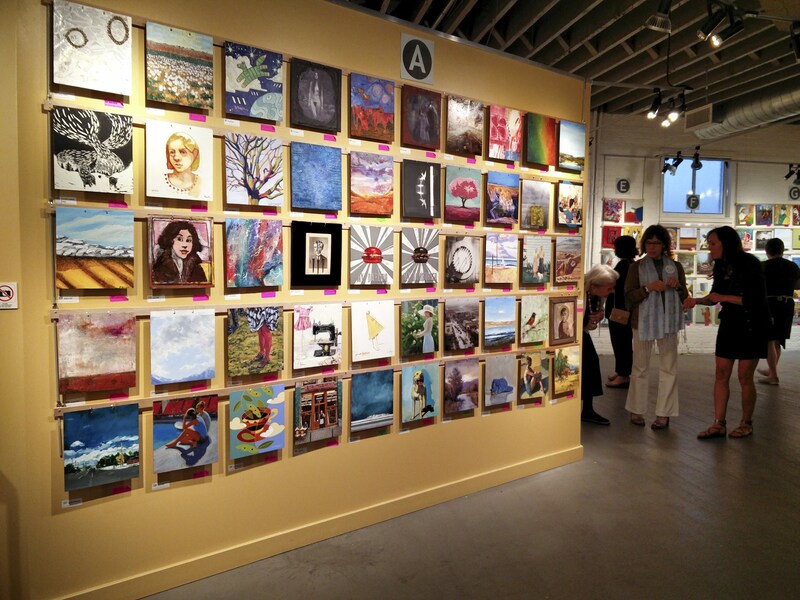 Locally OCI is the only organization to sell works that are specifically commissioned for their CSArt event. No organization in the Omaha region uses an artificial pricing strategy to prevent their charity sales from establishing a poor market price for an artist’s work. Organizations in other areas not only make good use of this strategy, but they even turn it into part of a game that adds energy to their event. 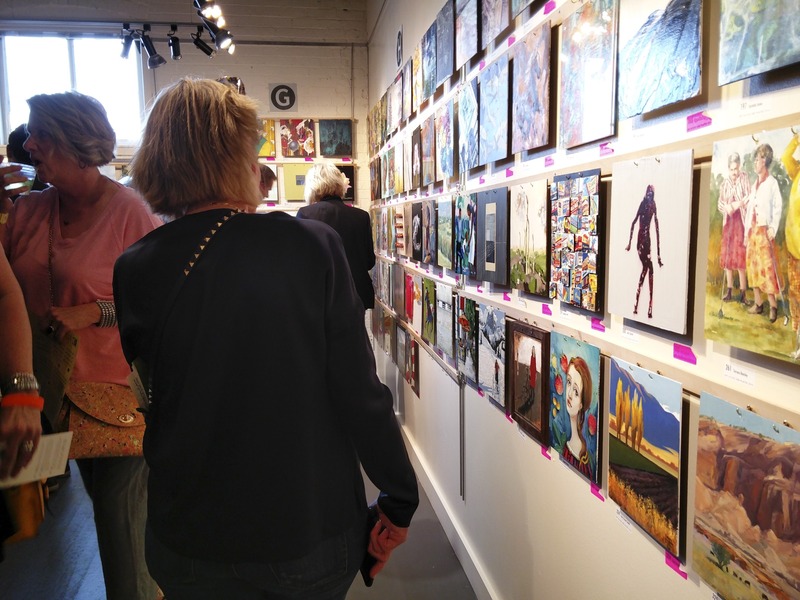 In Salt Lake City, Art Access raises money through its annual 300 Plates event. Each of the works is custom-made for the event on a standard 11” x 10” tempered panel plate. Plates are then distributed in random sequence on the wall, with the first plate selling for $85 and each successive plate selling for one additional dollar. The highest-priced work sells for $385. Each patron is issued a colored wristband for the event, and then admitted to the sales floor when their color is randomly drawn. The catch: each group of collectors is only given a few minutes to purchase a work before the next wave of patrons is allowed in. Joe Ostraff, the creator of the 300 Plates event, said that he assigned clearly random values to each artwork for sale specifically to resist commodification of the art. As leaders in the cultural community, arts organizations are in a position to educate donors about the kinds of transactions that benefit artists and the kinds of transactions that harm them, and to place their imprimatur on the former. Jack Zerbe, director of UNO’s School of the Arts, would like to see local organizations be more active in establishing community standards. OCI’s Saladino has committed to putting OCI’s resources behind this kind of educational effort. “We know the CSArt model isn’t giving artists the best deal,” Saladino said. “But we are very clear with the buyers that this kind of pricing isn’t the norm, that it is a training ground for artists and for new collectors. Joel Damon and Josh Powell, founders of Project Project acknowledge that “Project Project’s $100 Art Sale does utilize a ‘come buy art at a ridiculous price’ model,” but emphasize that they do not take a penny out of Project Project to pay themselves and instead save organizational funds to provide stipends for artists. (Damon and Powell volunteer all of their time at Project Project and do contribute their own cash as well to keep it afloat). They were reluctant, given limited resources, however, for their organization to take on a robust educational role with collectors. Charities that ask artists to donate artwork for free reinforce the idea that the labor of making art has little or no value in this community. By cutting artists out of the proceeds, fundraising organizations also give themselves more leeway to sell artwork at what would be otherwise be a loss. Many artists report receiving dozens of such requests annually. “People do not see art as your work,” artist Kim Darling said, “and it is so devaluing when people ask for donations for free. I want to give to things and support these programs, but it devalues my studio work. Brigitte McQueen Shew, executive director of the Union for Contemporary Art, acknowledges this kind of criticism. As a result of these concerns, McQueen Shew said the Union will be abandoning its $100 Art Sale altogether and replacing it with a fundraising model that offers compensation to participating artists. She also notes that the Union will be adopting W.A.G.E. standards, a new system for ensuring that artists are compensated for a wide range of tasks, such as loaning artwork for exhibitions. Bemis, Lux, and OCI all offer artists a share of proceeds from the sale of their work in their historic fundraising models. Experts in the field acknowledge that artists are often unwilling to challenge the practices of arts organizations and the wealthy donors that sit on their boards—a fact confirmed by Omaha artists interviewed for this article who voiced the fear that pushing too hard against the existing fundraising systems could have adverse impacts on their careers. The ultimate question thus remains: if arts nonprofits are, in fact, pursuing fundraising strategies that are harmful to artists, who is willing to tackle the problem? Oklahoma’s Karper points to one possible constituency that could effect change: art collectors themselves. Pointing to the success of fair trade campaigns that have lifted coffee farmers and artisans out of poverty in developing nations, Karper notes that we all have an option to abandon our expectation of the lowest possible price in favor of living wages for producers. In such a world, arts patrons would only attend fundraisers that offered transparent guarantees that artists were not being exploited economically. Emerson, the former director at the Lux, points to another possible solution. “I hate to say this, but if no one else is willing to look out for the artists, maybe the artists will need to look out for themselves,” she said.